Pink man begins # 1, 1997. Manit Sriwanichpoom, Generals Who Return Happiness #01, 2014. Manit Sriwanichpoom, Pink man begins # 1, 1997. 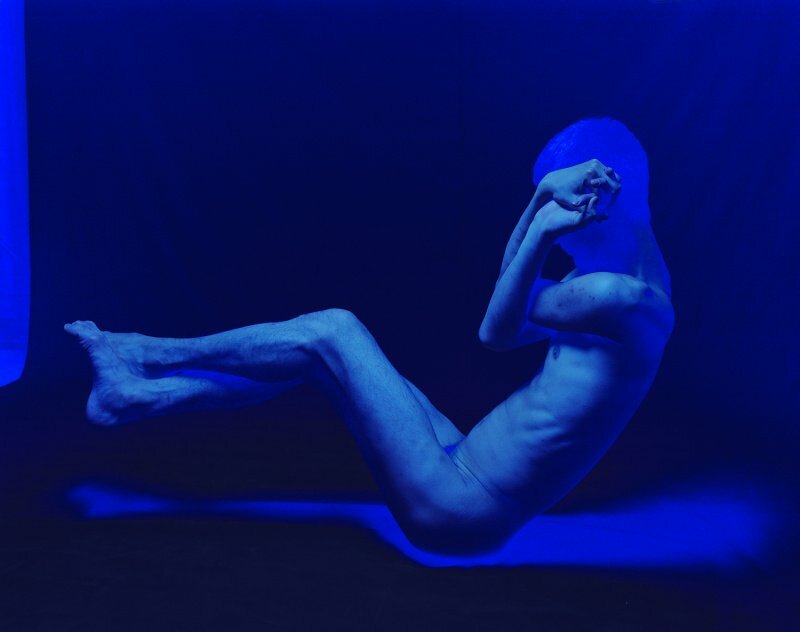 Manit Sriwanichpoom, Blue # 12, 2013. Continuing with our theme of Art & Politics this week, we speak with Thai artist Manit Sriwanichpoom on the challenges and process of making socio-political artwork in the current politically tense climate in Thailand. Since the inception of the art historical canon, artists and scholars have interpreted socio-political matters through art, by mastering a unspoken grey area, adept at conveying layered perspectives. In today’s political climate, while some regions enjoy relative freedom in regards to artistic expression, there are some in which censorship is practiced, disallowing certain issues to be discussed publicly. Regions such as South East Asia, in particular Thailand, which has still managed (in part due to this) to produce some of the most powerful political artists. A convergence of artist, photographer, writer or social activist Manit Sriwanichpoom is perhaps most well-known for his creation – the Pink Man. 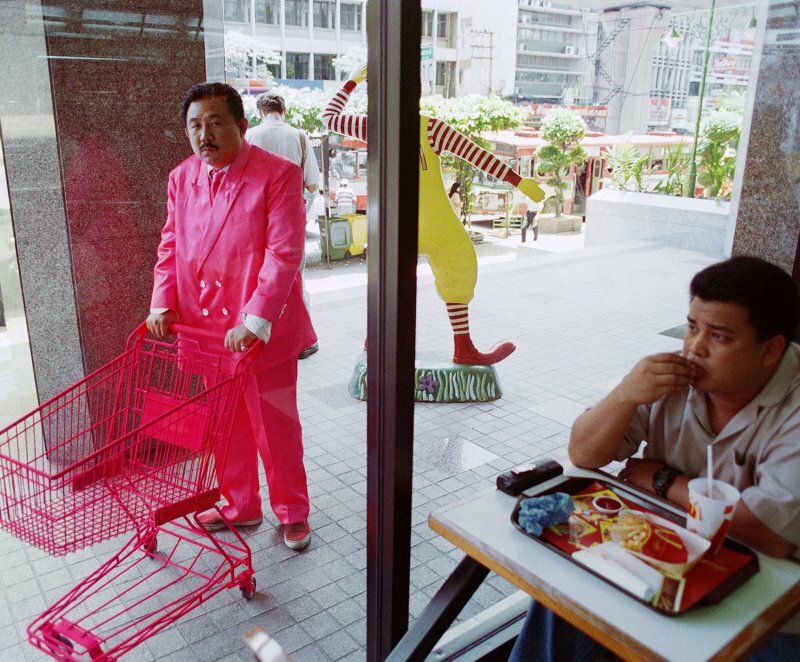 Featuring a figure of a man wearing a pink silk tuxedo is the protagonist of different series of photographs, shot at different locations around the world. The series are a stark a critique of consumerist society. A photo reporter in is youth, Manit came to understand that his interest nor his specialty lay in documenting or reporting what he saw in front of the lens of his camera. Rather, he wanted to uncover the aforementioned ‘grey area’ through a creative process: “I understood I didn’t want to run after stories. I wanted to make the story myself.“ Since then, Manit has been synthesizing his own narrative of political change and globalization. 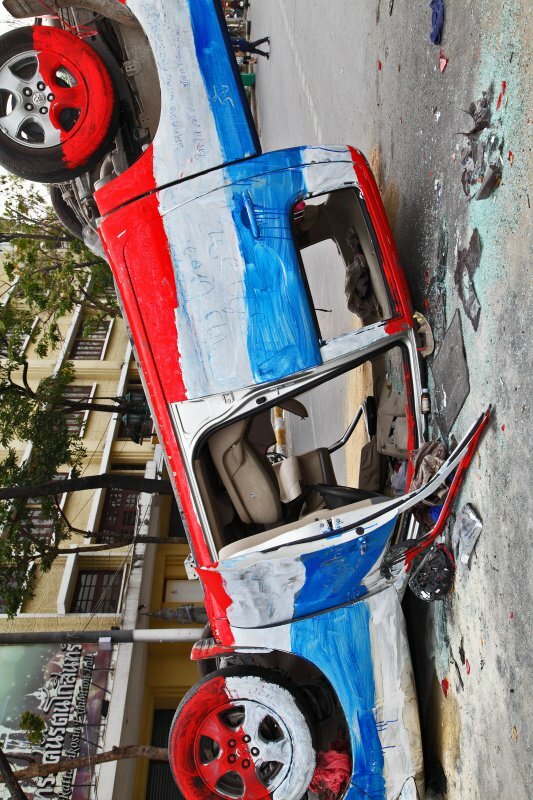 Manit has engaged with politics in Thailand by means beyond art. In 2007 he had a political stint funding together with artist Vasan Sitthiket the “Silapin Party”, an actual political party. Later on, he and his wife, filmmaker Ing Kanjanavanit opened the Cinema Oasis in central Bangkok, exposing people to films they wouldn’t normally see and proving a platform for independent filmmakers. Even though the first project has come to an end, it didn’t fail to make waves. 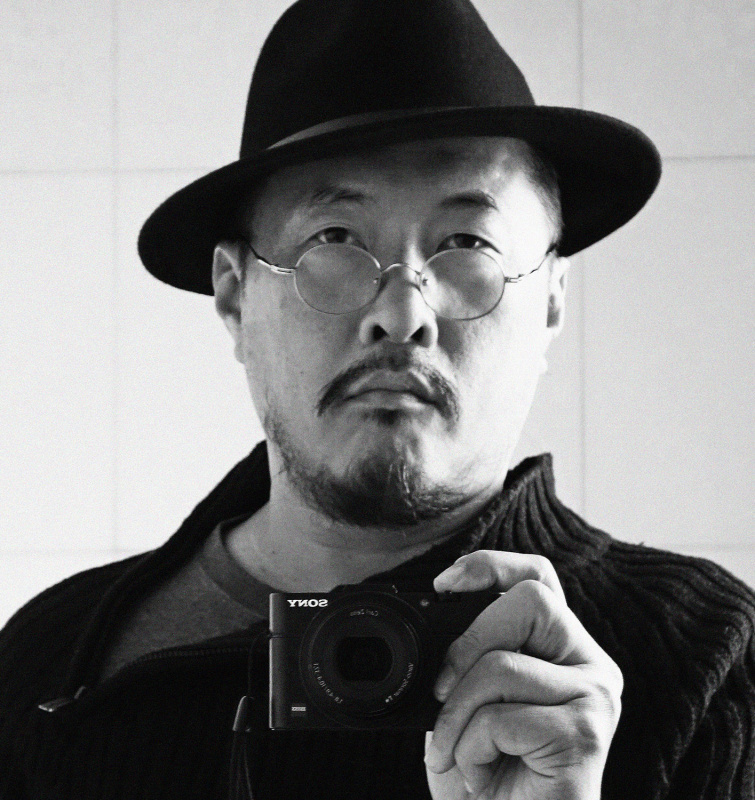 In addition to his artistic practice, another consistent role in Manit’s life has been serving as the director of his Kathmandu Photo Gallery on Pan Road, which he opened in 2006 with his wife. The space features the artist’s own works, but also those by emerging artists and photographers. This is where the artist speaks to us, recalling his earliest artistic memory. What is your first memory tied to art? As a child I didn’t know anything about art, given the lack of museums or galleries. Of course there was art in the temples, but the concept of contemporary art only came with the so called “modern lifestyle“. When I was young, it was the time when the economy in Thailand was starting to shift from agriculture to one more industrial in nature. From the rice fields to the factories. I remember at one point I met an architecture student who spent his time drawing and designing. I was so fascinated by that. I started dreaming about becoming an architect, but then when I enrolled into the university I ended up in visual arts. There I met a photography teacher who inspired me to start doing photography. The years you were in university were really pivotal for Thailand. How was the atmosphere in school? Were you already politically active at the time? In the beginning I wasn’t. At that time the senior students went to the jungle to join the communist party. By the time I arrived at the university, they came back, I met them and was introduced to social and political issues. Although I wasn’t personally involved, it was a big influence on me. After graduation I was eager to learn about my own country and society. I think before you criticize anything you must know what you’re talking about. So I spent my early years traveling for photojournalistic assignments. How come you started with photo journalism instead of going into art straight away? It was a practical choice in the beginning. You could not survive doing “art photography“ at that time. Photography wasn’t even seen as art. Also, I was young at that time, I wanted to learn more, to experience the world by working as a photo journalist. And the concept of story-telling through a single photographs was very compelling to me, it was very challenging, which I enjoyed. What made you transition from photojournalism to art then? What changed everything for me was an assigment to cover the situation with the Khmer refugees on the Cambodian border. I went to a secret Khmer Rouge camp at Thai border, thinking it would be a good experience to learn. The Thai government always denied the exhistence of that camp and I wanted to expose that. I wanted to show to the world that the Khmer Rouge was also present in Thailand. It was very dangerous, and when I went there I was arrested. I was saved by a Thai icecream vendor who told the guards I was a Thai, otherwise they could have killed me. From that experience I decided that this wasn’t what I wanted to do. Even in the best case scenario, as a photojournalist you run after a subject. You have to photograph a thing that is existing. You need to have your subject first, and then you create. For me, I didn’t want to just go and report, I wanted to create the story myself. Was it then that the Pink Man came about? When I started with Pink Man I understood I could push photography to another level, creating something that never existed before. The Pink Man is the materialization of an idea. One day I saw my friend Sompong Thawee performing and thought he would be perfect to impersonate the Pink Man. My friend’s melancholic stare conveyed that of a person who is materially wealthy and yet still unhappy. An important show you did in 2016, Fear, commented on the freedom of expression in Thailand. The exhibition open in four galleries in Singapore and Bangkok concurrently, how was this work conceived? For the show I wanted to reflect how contemporary Thailand came to be. The show was an investigation Thailand’s socio-political climate, beginning from the last general election in 2011 to March 2016. I wanted to describe the escalation of the conflict and how the country became divided. 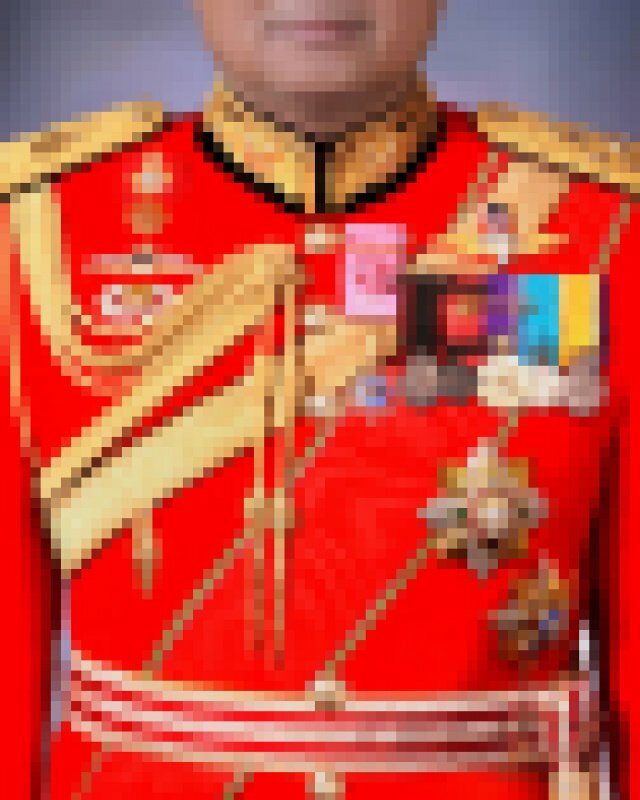 We have a central issue, the monarchy, which we can’t really talk about. I asked the question, what should a monarchy be in contemporary times? The problem is, we still cannot talk about this publicly. Your ouvre is largely based on your socio-political background, except for the “Blue series.“ Can you tell us more about it and how it fits into your practice? I did that series at a time we couldn’t have a public conversation because of the tense political climate and there was a lot of conflict. I tried to find the way to express myself, and the twisted body then became a metaphor. I shot the photos originally in red, and transformed them into blue. I played with the concept of blue, conveying sadness.